Andrew Kojima is East meets West in the truest sense. Half Japanese and half Scottish, he tells us he was named Andrew after the patron saint of Scotland, because he was due to be born on St Andrew’s Day. Kojima is a Japanese surname which means “Little Island”, but ever since school his name has been abbreviated to Koj. In early 2012, Koj appeared as a contestant on BBC1’s MasterChef. He called it a dream come true for an enthusiastic, amateur cook. Among his most enduring memories of the experience were: lunch service in a professional kitchen in his very first episode; foraging with Simon Rogan in the Lake District; being praised for his cooking by Michel Roux Junior; cooking for a 92-year-old Thai prince in Chiang Mai; and spending three days with Sergio Herman at his 3 Michelin starred restaurant Oud Sluis in the Netherlands. Since reaching the final of MasterChef, he has moved from his original career in finance to one in food and cooking. He now works as a freelance chef, food writer, and cookery teacher. We were fortunate enough to catch an interview with the globe-hopping culinary star to get him to share his take on sous vide cooking, Masterchef, and more. SVS: We first came across you as a finalist on MasterChef UK. What was your experience like on the program and was this the first time you were introduced to sous vide cooking? Koj: I had a great experience on MasterChef. I got to meet lots of amazing chef idols and got put though a lot of cooking challenges and tests that I would never have dreamt of and some of which I wouldn’t care to repeat! It was a very surreal process. Because I couldn’t tell anyone I was participating until the show actually aired! It wasn’t the first time I’d come across [sous vide cooking]. I had experimented with it as an amateur using zip lock bags and a slow cooker. It was a complete disaster! The bag disintegrated and got logged with water! So my first real experience was on MasterChef. It was the first time I’d used vacuum sealed bags and the water oven. I don’t think its necessarily a particularly good idea to do it in a competition when you’re not experienced in a given technique. I tend to use traditional techniques more. Obviously when the show had finished I definitely wanted to teach myself how to use the products properly, at which point I bought a SousVide Supreme water bath. SVS: How do you feel the SousVide Supreme water oven compares to other sous vide cooking devices? What are the additional benefits the products offer? Koj: First of all I like the design. I like the way it fits very sleekly in to my kitchen. I don’t like the immersion circulators in this respect as they don’t look great, they look a bit DIY in comparison! I like the reliability of the product, it keeps the temp nice and even and side steps the evaporation issue you get with immersion circulators. I like the easy to operate controls. And the capacity is very good too. It means I can do big dinners for up to 30. I’ve also got a SousVide Supreme demi water bath now, the smaller 8 liter more compact version, which I can travel with with ease, on flights etc. and is great for when I’m covering lots of courses at private engagements. It gives me a big window for adjusting timings if people are late or if there’s a delay in the courses. I also use just as a water bath for heating to take pressure of the ovens and the hobs. SVS: What are your favourite recipes that you cook in the SousVide Supreme water oven? Koj: My current favourite is Confit Duck. The SousVide Supreme water oven is a brilliant option for cooking this. It’s such a lovely way to get some beautiful and strong flavours in to enhance the duck, like thyme and star anise. With the massive benefit of retaining the succulence of the duck. I love doing pork crackling with it. I cook the skin and can cut off the excess fat. There’s two stages. Because of the vacuum seal it keeps the pork fat nice and flat, which helps when I come to cook it in the oven to crisp it up. Also I absolutely adore carrots and pears cooked in the SousVide Supreme water oven. This cooking technique really concentrates the flavours in vegetables and fruits, as well as meats and fish. I don’t see any point in poaching pears because what you are really doing is making a pear stock. Whereas when you cook them in the SousVide Supreme you’re cooking them nice and gently an intensifying the flavours. 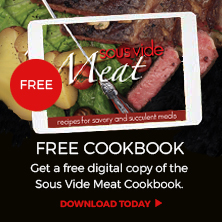 SVS: Did you use your SousVide Supreme water oven for festive entertaining this Christmas? Koj: Most definitely. Last year I cooked a turkey crown in the SousVide Supreme water oven that was actually the first time I’d cooked turkey at Christmas, because an oven does it and dries out the meat. If it wasn’t for my water oven I wouldn’t cook it at Christmas at all. The SousVide Supreme makes it absolutely beautifully succulent, with extra taste and the vibrant flavour of the turkey really comes through. Essentially cooking in this way keeps all the flavour in the bag. I then used all the juice in the bag and produced one of the best turkey gravies I’ve ever made. Christmas cooking timings can go all out for various reasons – family arriving late, church and the all-important present giving session! But this year it didn’t matter. If you have too many glasses of wine, it’s fool-proof and it frees up your time on the day to entertain your guests. SVS: What are your top tips for our readers for cooking turkey, at Christmastime or otherwise? Koj: Turkey is my top tip if you’re not cooking for masses of people. Take the legs off and save them for another day. Vacuum pack them and cook them separately for a wonderful turkey curry the next day – that won’t feature dried out turkey. On Christmas day, I just cooked the crown. It’s easy to vacuum pack once the legs are off. Once cooked just brown it off under a grill and finally use all the juice for the gravy – superb! SVS: Do you follow a particular style and influences in cooking or do you prefer to experiment with new flavours, ingredients etc? Koj: The type of varied chef work I do its very broad. I love Asian food, being half Japanese. When I’m working in a restaurant I’m always cooking all types of foods. It’s good for me as it means I’ve got a big pool of chef talent to learn new things from and do some self-teaching. SVS: How do you feel the SousVide Supreme water oven can benefit our community of sous vide home cooks? Koj: I think the biggest benefit is there’s a whole world of new flavours and experimenting to be done and it brings new skills to the experienced home cook. When I’m booked to teach privately, one of most popular things people say is can you bring the water bath? It’s new to people and they like to experiment. It’s a lovely new technique that appeals to people who already cook quite a lot but want to discover and try new things. Same as microwaves in the 80s…a new way of cooking but it’s not got the negative connotations, because its been used professionally for years. SVS: Do you feel that sous vide cooking is here to stay? What are your thoughts on future flavours and cooking styles? Koj: Yes I think that in the future kitchens will come with water ovens fitted in them. Many home chefs have steam ovens that are never used. But I can see water ovens fitted into home kitchens just as they are fitted in professional kitchens now as tastes and cooking skills improve generally. I think in the UK we’ll continue to see lots more international influence shape our cooking skills and tastes. There’ll likely be a lot more Asian influence, too, and I think as knowledge and skills improve, people are becoming a lot more organised about their eating and the way in which they cook and when they cook. I cook bits and pieces for the week days in advance, then chill or freeze them. Flavours – I see my students’ store cupboards with more and more with interesting spices and different condiments. Home cooks always say I don’t have that in my cupboard, but I think there’s more variety now than previously. SVS: Why are you so passionate about cooking? Koj: Firstly because hospitality is in my blood. My grandparents run a hotel and I love that act of generosity of cooking for people – all the better if they pay for it as well! And I love food, myself. I like the scope for experimentation and trying new things and techniques. SVS: What is the most unusual ingredient or meal that you have cooked in the SousVide Supreme water oven? Loin of kudu, grilled shallots, hasselback potatoes and cocoa sauce served in a rifle cartridge! SVS: What are your plans for the future – do you intend to continue to explore your work as a chef? Koj: Yes my plans are to keep my private chef work going. I’m going to work in a number of Michelin-starred restaurants over the next year to continue my learning from other chefs. I’ve started looking for venues to invest in near my home with a view to opening my own restaurant. Stay tuned!